June 7th, 2016: Updated the Deploying to Heroku section. The MongoLab Heroku addon now sets the config variable MONGODB_URI instead of MONGOLAB_URI. You need to rename this config variable to a name recognized by KeystoneJS. FEB 29th, 2016: Updated the Deploying to Heroku section. The latest KeystoneJS Yeoman generator (ver 0.3.13) requires an extra env variable (COOKIE_SECRET) to be set. 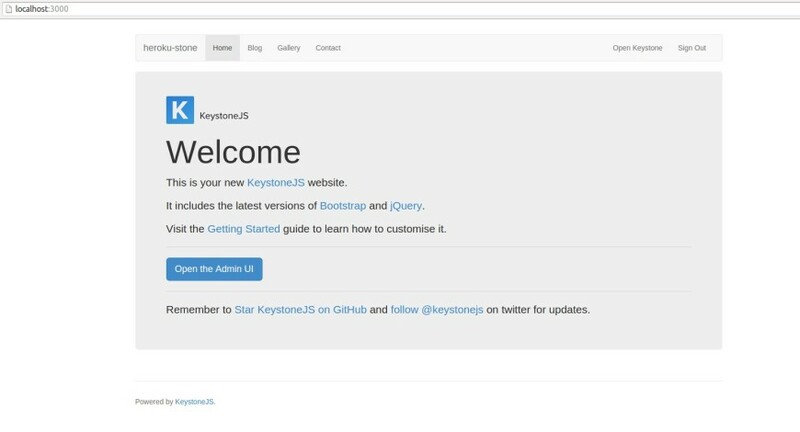 KeystoneJS is an open-source CMS and Web application platform for developing database-driven websites, applications and APIs in Node.js. In this post, I show you how to deploy a KeystoneJS sample app to Heroku. The installation and deployment process for a Keystone app should be similar for other operating systems. Before deploying your Keystone app to Heroku, you will need to install it on your local dev machine. A) Install the Yeoman Keystone generator. B) Generate a new Keystone project. Mandrill accounts are free for up to 12k emails per month. Please enter your Mandrill API Key (optional). See http://keystonejs.com/guide/config/#mandrill for more info. After answering the questions, you should have a directory named heroku-stone that contains your sample Keystone project ready to run. The template project already comes with a Procfile placed in the root of your application, which is needed by Heroku to start your app. Open your favorite browser to localhost:3000 and you should see a sample welcome page. It's time to deploy your app to Heroku. The Heroku platform uses git as the primary means for deploying applications. $ git commit -m " init commit"
NOTE: You won't be able to rename the heroku app to heroku-stone as we've already taken it. Just choose a name that's easy to remember for your app. d) Add a MongoDB add-on. Welcome to mLab. Your new subscription is being created and will be available shortly. Please consult the mLab Add-on Admin UI to check on its progress. By installing the MongoLab add-on, a config variable named MONGOLAB_URI was automatically created by Heroku which contains the mongodb connection string that our keystone app will use3. June 7th, 2016: The config variable created by the MongoLab Heroku add-on is now called MONGODB_URI. The latest version of KeystoneJS (0.3.19) does not recognize this name. You should rename it to MONGOLAB_URI. Compressing objects: 100% (148/148), done. Writing objects: 100% (153/153), 363.22 KiB | 0 bytes/s, done. Success!!!! You have successfully deployed your first Keystone app to Heroku.== You can now start making progressive changes to the app to customize its look and content. I hope this post clarifies some of the steps needed to deploy a KeystoneJS project to Heroku. Feel free to reach out to me if you have any questions. In one of my upcoming posts, I will explain how to integrate Ghost with a KeystoneJS app running on Heroku. Regenerate the sample app to eliminate the error message. Graduated with a PhD in quantum information from Mcgill University, part-time teacher, operates own company. Enjoys movies and playing tennis.